How time flies! It’s been 11 years since I last wrote about Mr Avocado! 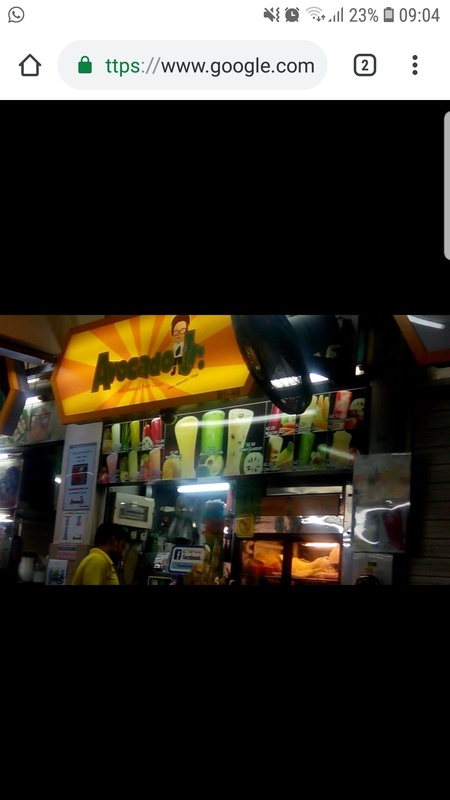 I visited the stall recently and finally got to meet the man who started the whole avocado shake phenomena at Alexandra Village Food Centre. He told me that he was the first to start selling avocado shakes at Alexandra Food Centre in the 90’s. The idea came from his wife who hails from Indonesia where the shakes are very popular. The shakes were an immediate success and soon he was attracting long queues. But, with the popularity came the competition and now Alexandra Food Centre can boast that it is the Avocado shake centre of Singapore! I haven’t tried the shakes from the competition, but his shakes are still as creamy and delicious as I remembered it the last time. His secret is in using really good quality avocado which he keeps in storage to make sure they are nice and ripe when he blends them. He was rather secretive about the other ingredients except that there isn’t any gula melaka in his secret formula! Has anyone tried the shakes from the other stalls? How do they compare? Even though it’s thick and creamy, the avocado shake is still still an excellent thirst quencher on a sweltering hot day! I love Avocado! I love it simply halved with cold lobster meat and thousand island dressing. I first learnt to eat Avocado when I was studying in Sydney. A lot of people have the misconception that Avocado is high in cholesterol. It is not. It may be high in fat (mostly monounsaturated) but it is not high in cholesterol. In fact, there is none at all since cholesterol is found only in animal fats. No vegetable fats contain cholesterol. Being high in monounsaturated fats explains why it is so creamy and yummy! Abosolutely delightful. If you like chendol and chocolates you will love this stuff! His disciple is operating a stall at beach road hawker. It has a similar taste. Always remind me in the 90s when I will always visit uncle for avocado milk or strawberry milk after i bought my shoes from queensway shopping centre. Ah, I shall look out for it the next time I am there! Home » Eat » Mr Avocado Exotic Juice: Avocado Shakes at Alexandra Village! Liquid Gold!